In the contemporary scene of the writers of detective novels , specializing in the classical genre , Peter Lovesey has a prominent place. Born in Whitton , in 1936 , Lovesey has spent many vicissitudes in 1944 his house was destroyed during a German bombing ; had a passion for sports and dabbled in athletics , but soon realized it was not his way ; attended the University where he met his current wife ; he devoted himself to teaching but then you chose the career of full-time writer . He lives near Chichester. He signed with his real name all his novels except three , signed instead with the name of Lear Petert . His son Phil writes detective novels . He won the Grand Prix de Litérature policière ; in 1978 he won the Silver Dagger Award for her novel Waxwork ( repeated in 1995 with The Summon , and in 1996 with Bloodhounds ) ; four years later he won the coveted Gold Dagger Award for her novel The False Inspector Dew . She also won the Prix du Roman d’ Aventures with the novel A Case of Spirits, the Macavity Award with Bloodhounds ( repeated in 2004 with The House Sitter ) and with the same novel also the Barry Award . 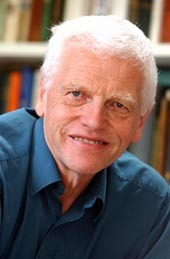 He also won the Cartier Diamond Dagger Award in 2004, and the Agatha Award for Lifetime Achievement in 2008. In 1988 , his Rough Cider has been selected in the final five of ‘ MWA Edgar Award , and again in 1996, The Summons . 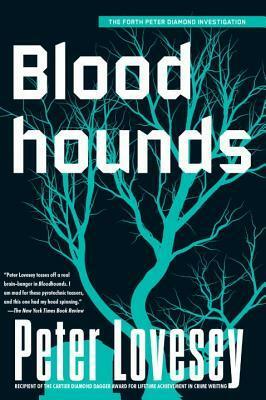 A group of loyal readers of thrillers , known as the The Hounds , come together in an underground chapel of the Church of SS. Michael and Paul, at Bath . They are : Milo Motion , Hilda Childmark , Jessica Shaw, Polly Wycherley , Rupert Darby, Sid Towers. At one day also , Shirley -Ann Miller joins to these. She made himself known for her versatility in the kind of knowledge and for her kindness . The Hounds occupe themselves principally about Mystery , while somehow they abhor the rest . Inside, Shirley -Ann recognizes dynamics certainly not idyllic , that make well understand how , beyond the similar knowledges, the affiliates to the group are not all united by feelings of close friendship : she already sees the day when Rupert ports downstairs her dog , provoking the ires of someone, especially Hilda Chilmark, an old heir of an illustrious family fallen into disrepair, who not mindful about this, treats others as if they were a notch below her . The attitude of rejection towards Rupert and his dog , is accentuated at another occasion , during which both Sid Towers and Milo Motion ( both Carr fans) would have to bring along a copy of The Hollow Man , to discuss it into the group , and also read the Conference by Dr. Fell. At this occasion, just the lady Chilmark has an attack of hyperventilation , and then recovers by the intervention of Jessica Show that after she eliminated a paper bag where Motion kept his copy of the Carr, she provides to Chilmark to restore her proper breathing. The fact is that the incident provides an opportunity to introduce into the copy of the novel by Carr , owned by Syd Tower, a rare stamp from 1 penny black , stolen a few days earlier from a city museum , theft which had been announced in advance by a message in the form of quatrain , and that he had alerted the city police : the same Peter Diamond , superintendent of police of Bath, and head of the homicide departments , had provided some of his men to Inspector Wigfull, including Inspector Julia Hargreves, to find the stolen stamp. At the moment in which the stamp reappears, at the meeting of The Hounds, and after the attack of hyperventilation of Hilda Chilmark, the suspect (also in the reader ) that one of the hounds may have been the thief of the stamp, creeps. Syd , after a confrontation with the other hounds , he decides to go to the Police Station and report the discovery in his book, which he swears he never left from the time when he took on board his boat where he lives . The fact is that Syd , after denouncing it in most interviews, and be able to demonstrate that he was not the theft of pennies, returns to the boat owned by him in the company of John Wigfull , and , after opening the lock with which he holds closed the cabin , he finds dead Milo Motion: the lock is of a special type , German, with only two keys that can open it , and one key of both fell in the water where the boat is anchored more a year before ; The cabin has no other openings , if not another door that is bolted from the inside , however, by a number of bolts ; Syd swears that the only key to open the lock was always in his hands , and at the same time professes her innocence . Further investigation will show that he is not the killer . How did Milo Motion to enter into the booth and why? How did someone kill him and be able not only to open a padlock Syd swears that it has closed , but also to close it, for the physical impossibility that the lock may have other key to open it? And above all, why was he killed ? The most incredible thing is that the impossible murder appears to have been previously announced by another quatrain , whose meaning is incomprehensible before subsequently put in report to the novel by Carr. It ‘s clear at this point that if someone had previously suggested that the thief could be one of the Hounds, now there must be between them even a murderer , if the murderer is not also the thief. Various hypotheses will make their way on the identity of the thief, also able to explain the murder , but the resolution will come only at the end of the novel, after we will admire two hypotheses about the solution of the Locked Room (at the second , Diamond will destroy the first by Wigfull , after the discovery by police divers of the first key of the padlock ) for brilliance and flair , after a second murder will throw more sand in the eyes of the investigators ( Rupert Darby will be killed , awkward and unpopular man to most people) ; and after that someone will begin to suspect a blackmail for the detriment of another member of the Hounds, uncomfortable for a pregnancy and the birth of a secret son , always gravitating in the group of The Hounds . The novel has not a granted end, because two tight end are taking place: the first , with two culprits almost sure but announced too , and another , the true final, with a guilty not granted , not far from the action and at the same time never kept in mind of the investigation, and brought under the spotlight , only after the final reflection by Diamond. Spectacular and beautiful novel , it presents an incredible variety of characters (and thus driving ) , even within a narrative structure , already consolidated and addressed in other novels by other writers: in fact, the so-called association of The Hounds , formed by readers and passionate lovers of thrillers , is only the last in order of time , among the many that have preceded it : suffice it to say that Blacks Widowers by Isaac Asimov , or The Seven Solvers in Invisible Green by John Sladek , or even the three friends mystery fans , who will face off in Gammal Ost by Ulf Durling . 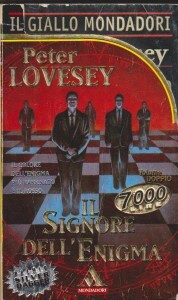 It is necessary to recall that Lovesey , in the novel also introduces a vein decidedly humorous , and ironic ( just remember that The Hounds meet themselves in an underground chapel of a church , nor they were the followers of a sect , within collide rivalries , hatreds , and are committed thefts , blackmails and murders : a satanic cult , almost) : it is as if the author himself ironized about who takes terribly seriously the Mystery Genre. Lovesey , however, impresses in this novel, his recognizable trademark : a tribute to John Dickson Carr, recalled from beginning to end , through allusions , quotations and conferences , which have as a reference, the most novel reminded by Carr : The Hollow Man (The Three Coffins). This giveaway is not only formal but also substantial because is processed a double Locked Room enigma : a murder in a cabin of a boat, hermetically sealed from the outside by a padlock thief-proof , and from the inside by another door closed by a bolt ; the appearance of a rare stamp , stolen from a museum, in a book that the owner swears he never deposited elsewhere ( and he is not the murderer ! ) . Added to this is the mood light which permeates the novel, the humor always present , the tumult of the suspects , the true and false tracks , the crackling inventions that are never final , but always leave a second chance to reasoning. Unlike by other authors who keep up rytm with the action , Lovesey fails to attract the reader’s attention (which doesn’t fool till the end ) only with the his ideas. Indeed , the fact that in twenty pages from the end, Lovesey indicates a possible suspect , it is not for me to be put in relation with the tendency of some writers of the old school to use the last few pages , as a kind of summary that explains the facts earlier; for me, instead, the author is launching another false bait, so that the ultimate truth is found elsewhere : it is the old assumption by Agatha Christie , whereby because the picture of the situation can be said to be solved at all, it is necessary that all pieces of the puzzle fall into place , not in any way forcing their inclusion. The only thing that leaves here and there dumbfounded is the hidden explanation of a particular event, not communicated to the reader immediately and instead only revealed at a later time (the splashes of white paint not only on the basque by Rupert but also on the coat of fur of his dog, which had not been brought by him to the inauguration of the painting exhibition ), even if you immediately understand its scope : it holds high the reader’s attention on the contextual assumption, until it is revealed the hidden detail , which it leads to a solution diametrically different, though not definitive as regards the discovery of the killer. Lovesey ‘s attention about the personalities of the actors in the drama , most importantly , is not at all related , and this is demonstrated by the influence that all the characters have in the course of the narrative : even what would seem to be the only person not to can be inserted into the group of be suspected , because the only joined the group of The Hounds after, will play a very important function albeit indirect , and this person will enter by force in the final solution , although not personally . So in the novel , the trend of action will see the beginning coincident with the end and vice versa. As Carr lost his home in World War II in an air raid, also Lovesey lost his home in 1944, destroyed by a V1 Flying Bomb. Questo articolo è stato pubblicato in Uncategorized il novembre 13, 2015 da 282daniele.